Quality Starts with Cleanliness Many visitors and inspectors have noted how exceptionally clean we keep our facility. We take great pride in our products, evidenced by the condition of our work environment. Raw Ingredient Bins Dave is the mixing and pelleting operator.We receive the majority of our raw ingredients in bulk tote bags. They are hoisted into dedicated production bins where they are automatically weighed according to the recipe entered into the production computer. The weight of each ingredient is checked 3 separate times to ensure absolute accuracy. Nutrient ratios are that important! The Pellet Mill This piece of equipment pelletizes the ingredient mixture. Like the rest of our equipment, it is highly automated with numerous quality control sensors built into the process to monitor the operating parameters. We even monitor the electrical current on the main motor to catch and correct a minor problem before it has the chance to become a major problem. The Filling Operation In this photo, Dr. Gravlee looks on as a pail is being filled with the Farrier's Formula® pellets. The pail was automatically denested from a stack of pails and positioned under the filling station by a smart conveyor. The filling begins once a photoeye has sensed the presence of the pail. Each Pail or Vacuum Bag is Scanned for Labeling Accuracy Some people might say we overdo our checks and balances. We adamantly disagree. We ship our products all over the world because there are horses that need them to meet their full healthy potential. Our goal is to provide each and every horse with the best product. So being accurate 99% of the time is simply not good enough; our goal is 100% for product quality and that includes the label on the bucket as well. 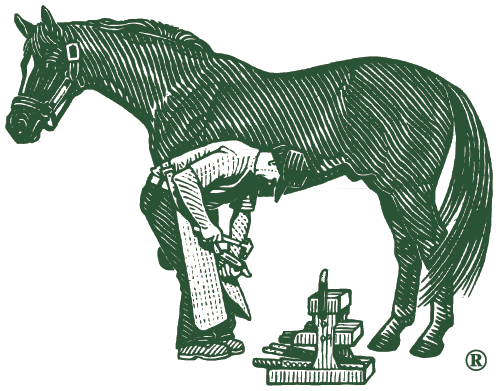 Airtight and Light Resistant Containers From the beginning, Dr. Gravlee has insisted on utilizing the highest quality ingredients and demanding that Farrier’s Formula® is packaged in airtight and light resistant containers in order to maintain product quality and freshness. Vacuum packaging with nitrogen flushing is the ultimate means to preserve product freshness and shelf life. Lid Placer and Sealer The lids are automatically placed and sealed prior to being automatically placed inside a box. Palletized and Stretchwrapped After boxing, each case is then palletized and stretchwrapped to prevent any damage during shipment. It would be a shame to exercise so many quality control checks throughout our operation only to have the product arrive at your door in a poor condition. Finished Product Andy is the packaging operator.Farrier's Formula® Double Strength is available in 11 lb. vacuum bags and 11 lb. pails. The packaging line is composed of several automated machines that work together in unison to produce a finished product ready for shipment. In Stock and Ready to Deliver We will ensure that our products are where you need them anywhere in the world.